Due to its societal and economic relevance, Project Management (PM) has become an important discipline and a concept critical to modern organizations, public and private. PM as an academic discipline is discussed both in Management Science and in Operations Research. Management Science tends to focus on quantitative tools and the soft skills necessary to manage projects successfully. Operations Research gives the essential scientific contribution to the success of project management through the development of models and algorithms. In Management Science, Operations Research and Project Management, José RamÃ³n San CristÃ³bal Mateo fills the gap between scientific research and the practical application of that research. Project managers need formal training in decision-making but sometimes, they do not have an in-depth knowledge of Operations Research or they lack the necessary theoretical background. 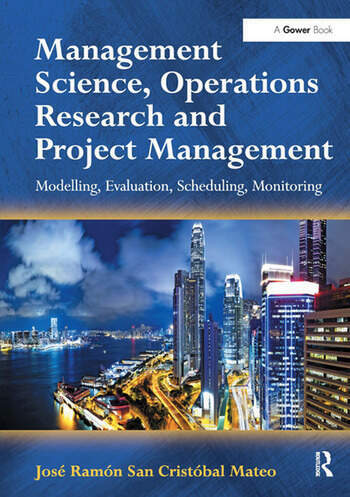 This book, with its focus on the quantitative models of Operations Research and Management Science applied to Project Management, provides project managers with the tools and methods necessary to manage projects successfully. Project managers operate in a complex global environment, in which numerous factors need to be considered, such as minimizing total project costs, meeting contracted dates, and ensuring that activities achieve certain quality levels. The focus here on the application of quantitative models of Operations Research and Management Science applied to Project Management provides them with the tools and methods necessary to make sound decisions. José RamÃ³n San CristÃ³bal Mateo is a Senior Lecturer and Head of Nautical Sciences at Escuela Técnica Superior de NÃ¡utica at the University of Cantabria, Santander, Spain. His PhD is in Marine Sciences. He has authored many papers and two books.